This half hour documentary is the 'original' Bush Mechanics as produced by Warlpiri Media Association, a remote community video and radio facility in Yuendumu, Central Australia in 1998. The modificiation of the craft or car maintenance in the outback highlights many of the adaptative qualities desert people have utilised over the last seventy years. This adaptive culture is highlighted in the technical details of the surprising, greasy, gritty and sometimes irreverant stories of this documentary. This documentary also brings us close to some touching details and renditions of male to machinery relationships. We also get a feeling of the harsh and beautiful terrain the cars and the families they carry call home. The Bush Mechanics form a rock band and their first paying gig is a half-day's drive away — now they just have to get there. None of them owns a vehicle, so they resurrect a derelict car, load it up with band gear and hit the road. This episode follows the five Bush Mechanics as they bounce along rough bush tracks, occasionally encountering Jupurrula, the magic mechanic who helps them overcome their various car catastrophes with his bush ingenuity. 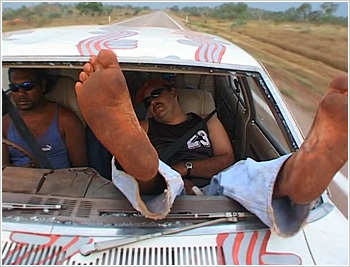 The Bush Mechanics travel to Alice Springs to collect their nephew from jail and wind up having their own brush with the law. Although their nephew Walter has done his time in jail, he still must be brought back to the community to face Aboriginal law or "payback". On their way home, the Bush Mechanics try to appease an eerie night-time spirit who visits Walter in his dreams. As they approach their destination, the police stop them and send half the gang back to jail for having unpaid warrants for shooting cattle. After an exhilarating win against the Yuendumu Magpies, four Mt Allen football players become stranded when the team bus leaves without them. To get back home, they "borrow" the rival team coach's car. An hilarious high-octane car chase ensues as the Bush Mechanics are enlisted to catch the culprits. The episode concludes with a spectacular act of revenge when the abandoned car is found. With the country in the grip of severe drought, the Bush Mechanics are summoned by the rainmaker, Jungala, to go to Broome in search of rainmaking pearl shells. In the old days, Jungala would have traded bush tobacco for the valuable shells, but this time he trades today's commodity — a motorcar he has painted with the Rain Dreaming. As Jungala sings them on a safe journey, the Bush Mechanics are beset with dust storms, fires and unfamiliar landscapes as they travel to saltwater country to trade an old Ford V8 for the magical pearl shells.